Darlings, your cute boy du jour may subscribe to Andy Warhol’s way of thinking that is “I want to die with my blue jeans on,” but there are times when, as the fashionable femme fatales that we are, we wouldn’t mind seeing our suitors step out of their standard denim and into a more dapper style of clothing. And now that the holidays are just around the corner, we have the perfect excuse to blatantly ignore their moaning and groaning about shopping, and simply head off in the direction of the mall to scoop up whatever catches our eye…for them, of course. If, however, you are of the petite persuasion who feels more at home with a boy who boasts not just extra height, but muscles galore, you may find yourself frazzled by the lack of shops that accommodate the big and tall boys in our lives. Luckily for you, large size clothing from high and mighty is readily available with the simple click of your mouse, offering you a vortex of fabulous looks – from formal shirts and bow ties a la Gossip Girl’s Chuck Bass, to his ultimate favorite…uber-casual (yet utterly adorable) denim and sneakers – for the charming Prince in your life. Tell me, lovers…what boys clothing style is your personal favorite? Even better…what special someone will you be shopping for this holiday season? Thanks to The Paramus Post for the picture. I'd love mine in slacks and a sweater, but I get slouchy jeans and Tees instead. My boyfriend is an excellent thrifter. He finds some cool things that way. He's always at his best in black jeans and a cool jacket that might have a leather look to it. Oh, I wish I could dress my boy in clothes like this. I think that may be my new project. I love a guy in great jeans and a vintage tee... But can't beat one in a tux either! I always shop for my boyfriend and have a lot of fun picking shirts and other cool items. I just like it when guys actually put some effort into their appearance. It's like girls spend a lot of their life developing their own personal style, and dudes just don't seem to care about theirs. I once had a guy-friend say to me that dressing nicely is "cliche". I wanted to strangle him. I think wearing band T-shirts every-single-day is cliche. I love shopping for men! 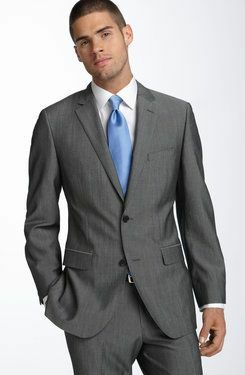 There's nothing better than a well tailored suit! Oh..my..well, I'd love to wear a suit. Bow tie included. Something about it, just gives instant confidence. An oxford shirt is divine! Just altered my guy's pin-stripe--he's all chiced up now . . .